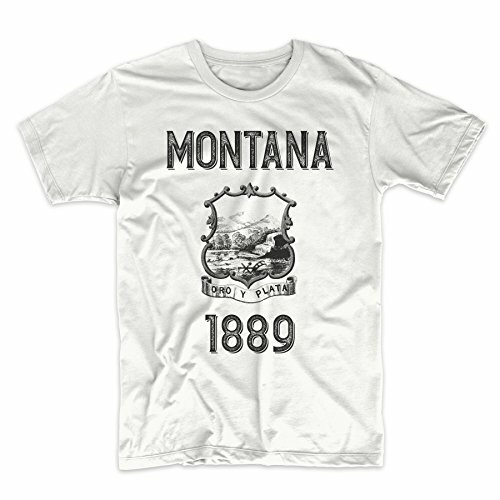 PatentPrints Montana Coat of Arms T Shirt by PatentPrints at Sherlock Coat. Hurry! Limited time offer. Offer valid only while supplies last. Show off where you are from, with our Coat of Arms T Shirts! These shirts are offered in Tri-Blend Next Level 6010 and Next level 3600 100% cotton. Show off where you are from, with our Coat of Arms T Shirts! These shirts are offered in Tri-Blend Next Level 6010 and Next level 3600 100% cotton. T-Shirts are available in unisex adult sizes S - XXL. And youth sizes XS - XL. Our unique T-shirts are professionally printed in house to create a smooth lasting finish wash after wash. Youth T-Shirts are a perfect gift for the youth in your life. Youth garments are printed on Classic 100% preshrunk cotton jersey. Gildan or Fruit of the Loom. If you have any questions about this product by PatentPrints, contact us by completing and submitting the form below. If you are looking for a specif part number, please include it with your message.